This unique cider combines a dry cider base with tart Michigan cherry juice. Pouring a lovely shade of red, this snappy cider features an unexpectedly creamy mouthfeel. 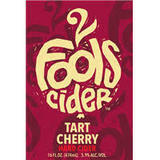 A refreshing departure from sweeter fruited cider and a cider that fans of sour beer will love.